Betsy and I had some friends over for dinner last weekend and I wanted to try a recipe out of the most recent Bon Appétit. The recipe ended up being delicious, but I found the instructions in B.A. to be almost unintelligible. I have a few notes on this dish before I really show you how to make it. I did stray from the recipe slightly. I couldn’t find pork belly so I used thick sliced uncured bacon which is basically the same thing. I would like to try it again with an actual slab of pork belly. Bon Appétit’s instructions really let me down on this one. They had these drawings that were supposed to help you assemble the roast and basically it looked like: Put Blob A on Blob B. Blob side down. There were no distinguishing characteristics on the drawings and they were impossible to follow. I’m still not sure if I did what they wanted me to do, but whatever I did was yummy. I think sometimes people are intimidated by large chunks of meat. I’m not really sure why. Large roasts are easier to cook than small slivers. There is way more room for error. It takes real expertise to cook a single pork chop and not dry it out. The roast is easier in my opinion. 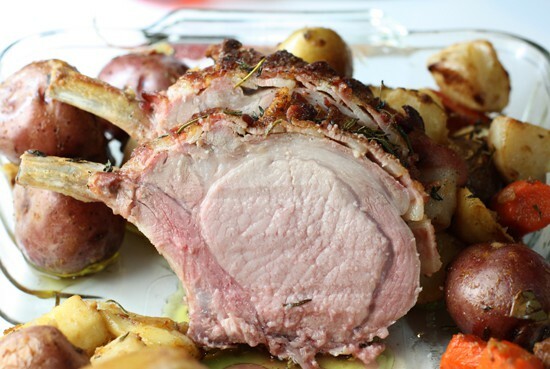 How to cook a full pork rib roast with the bone-in. It’s a beautiful presentation and delicious dinner. 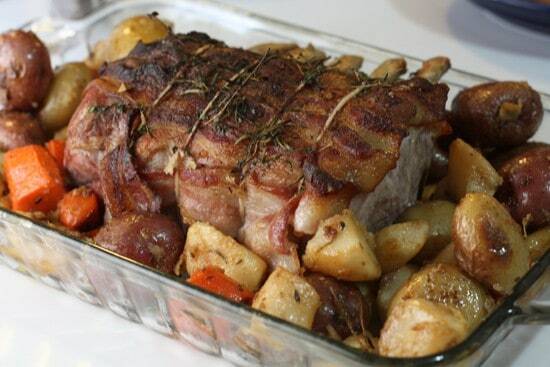 1 pork rib roast. One rib per person. 10 ounces uncured bacon. If you can get pork belly, give it a shot. 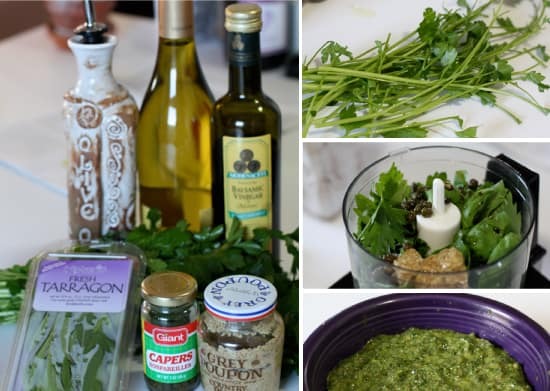 For the salsa verde, Mix all finely chopped ingredients together or pulse a few items in a food processor. This will keep fine for a few hours if you want to make it in advance. 1) Rub roast well with salt and pepper and preheat oven to 425 degrees F.
2) Lay strips of bacon on the top side of the roast. The bones should be underneath. Overlap pieces like shingles. 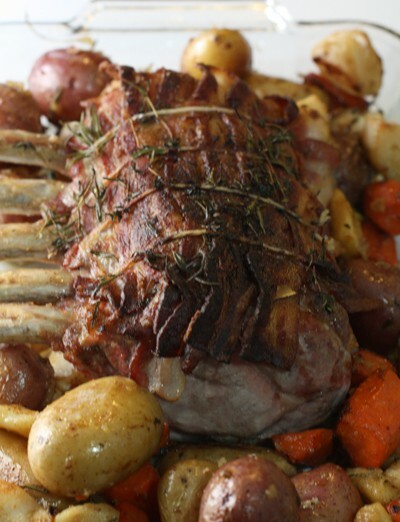 3) Wrap your twine around the roast, but don’t tie it yet. First, stick about half of your fresh herbs (you can use dried if that is all you can find, but fresh is ideal) on the bacon. 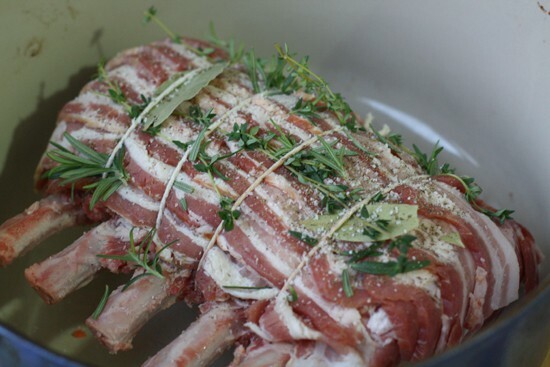 You want the twine to hold the herbs close to the bacon. 5) Meanwhile, roughly chop all peeled veggies and toss with olive oil, salt, pepper, and remaining herbs. 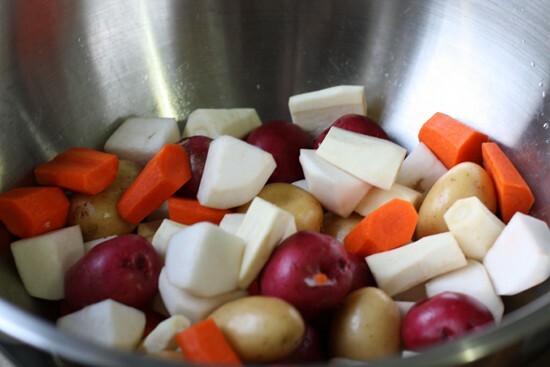 6) Then add your veggies to your pot and bake uncovered for about 45 minutes at 425. 7) Stir veggies so they are cooking evenly and turn temperature down to 350 degrees F. Bake for another 60-75 minutes until pork reaches an internal temperature of around 145-150 degrees F. This time will vary depending on your roast size. Please use a thermometer! 8) Take your roast out and let it rest for about 20 minutes. Slice and serve with salsa and roasted veg! An interesting addition for this dish is an Italian salsa verde. I don’t think it is essential to the dish as the pork is very delicious without it, but it definitely adds some flavor and color to the dish. Basically, mix all of the ingredients and process them together. If you don’t have a processor, you could chop stuff up really fine. It might just be a bit more coarse. You can make this a few hours before dinner and it will keep fine. This is what you will get from the butcher hopefully. If any parts look too fatty, you can trim off some. This one is pretty good. 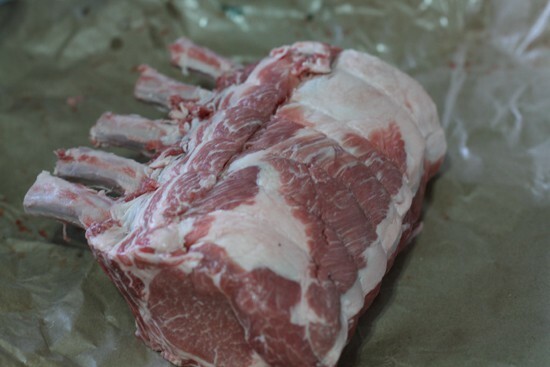 When ordering from the butcher, just order a rib roast. Make sure you let the butcher know how many ribs you need and that you don’t want it cut up. I think eight ribs is the most that normal pigs have unless you can get access to some crazy mutant 10 ribbed pig. Generously rub coarse salt and pepper all over the roast. Get your strips of bacon and start laying them on the top side of the roast. The rib bones should be underneath. Overlap each piece of bacon sort of like shingles. 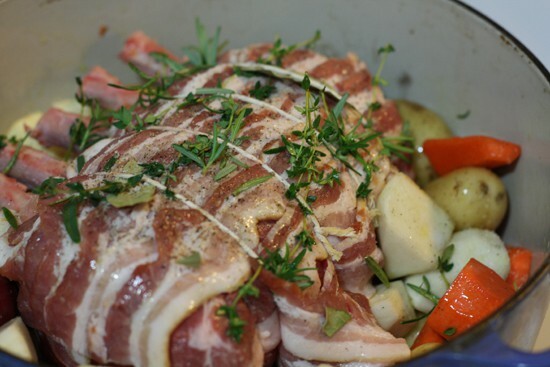 Then in three or four spots, wrap your twine around the roast, but don’t tie it yet. First, stick about half of your fresh herbs (you can use dried if that is all you can find, but fresh is ideal) on the bacon. 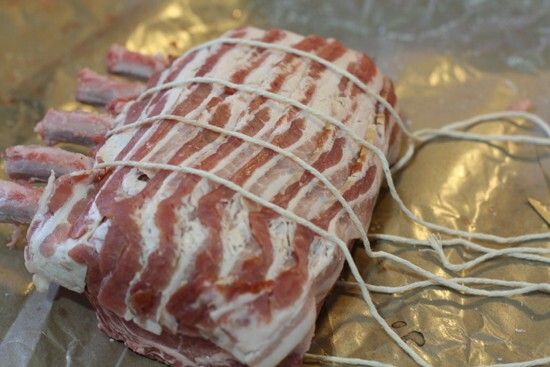 You want the twine to hold the herbs close to the bacon. You can stick some herbs underneath the roast as well. Tie up the butcher twine until it is tight. Then put it in your roasting pan and let it sit at room temperature for about 20 minutes. Cover it during this time. Don’t worry. This is completely healthy. Also, pre-heat your oven to 425. Is this the most beautiful thing I’ve ever made? Maybe. Meanwhile, prep your veggies as I mentioned above. You should end up with something like this. Toss these veggies with olive oil, salt, pepper, and your remaining herbs. Potatoes, parsnips, turnips, carrots. Oh my! Then add your veggies to your pot and bake uncovered for about 45 minutes at 425. 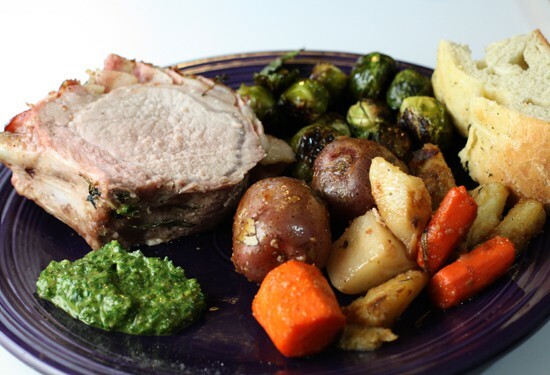 I list meat thermometer as an ingredient because it is absolutely essential to this dish. 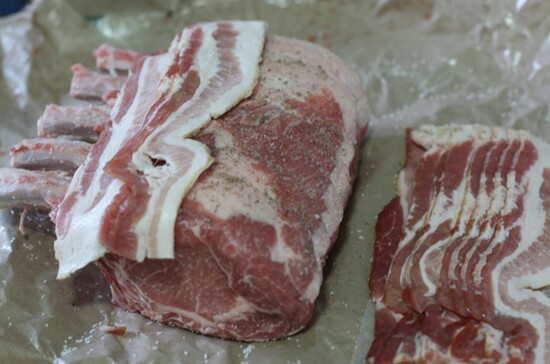 There is no better way to ensure your pork is done without cutting into it, which is the last thing you want to do before it is ready as it will dry out. Once you have cooked for 45 minutes at a high temperature, stir your veggies around a bit (you may have to temporarily take your roast out of the pan). You want to make sure they are cooking evenly and not sticking to the pan. Then bake at 350 until your thermometer reaches 150-155 degrees. For me this was about 75 more minutes. Note: Obviously this cooking time is dependent on how big your roast is. Adjust accordingly. Take your roast out and let it rest for about 20 minutes. Then you can chop the roast up to inspect your work. A good serrated knife is best for this because your bacon will be really crispy and sort of tough to get through. Cut evenly between each rib. A good serrated knife is your best bet. Serve with a full plate of veg, any other sides you wish, and a heaping portion of the salsa verde. I’m always nervous to try a new dish for guests, but this one turned out really nice. The pork was super-tender and the veggies were soft but not soggy. The salsa verde gave the whole dish a really fresh lift. If you are looking for a fantastic dish to really wow people, this is a good one. No doubt. If you liked this recipe, I would love it if you passed it along to others using the below icons. this looks dynamite, especially for a cold night. also i'm totally jealous of your new camera. your pictures are looking great! This looks outstanding! Love the pork-on-pork! And the salsa verde is something I would never think to pair with it, but it sounds delicious. This post could only have been improved by a picture of your full and happy guests! It was delicious — you can make this for me anytime. I have that same problem with Bon Appetite. It looks like you pulled it off though! Your wonderful photos make me want to try this recipe. It looks fantastic! Thank you. Merci bien !!! for saving us from another one of my darlin' husbands DRY, TASTELESS, OVERCOOKED, Pork Roasts! Love your kick-A Website ! To prevent the veges from becoming mushy, roast them in a separate pan after tossing with olive oil, salt and pepper at a high temperature (450) until tender and set aside until roast is done. Take toast out of the pan when done, and toss the veges in the juices that are left in the bottom of the pan once you have skimmed off the fat. Ina Garten, the Barefoot Contessa, always advises roasting veges this way because they get caramelized – just turn them in the pan and watch that they don't burn. Why don’t you put the fresh herbs UNDER the bacon? Seems like the bacon would ensure the herbs would release their fragrance/essence in a more perfect way, esp since you don’t cover the roast?